In our rushed lives, breakfasts are generally the first casualty. Just a bowl of cereals with double-skimmed milk and a glass of canned juice is the maximum we seem to manage before we are off to work. However, if we really want to be healthy, then we should, as the popular adage goes, breakfast like a king, lunch like a prince and dine like a pauper. Let’s then present to you a King’s breakfast, of Sauté peas, scrambled eggs, roasted tomatoes, toast, and your favourite beverage. Wash the peas thoroughly. Light the fire and put the pan on it. Add the butter and let it melt. Add the peas and stir it well. When the peas start changing colour, add the salt. Reduce the flame to sim, add the water and cover the pan. You will see that the steam starts escaping after awhile. Keep checking till the water has dried. Please ensure that your peas don’t burn or become mushy. Your sauté peas is ready. Wash the tomato thoroughly before cutting. Cut the tomato in half. Light the fire and put the pan on it. Add the butter and let it melt. Place the tomato cut side down and let it sizzle for a minute. Turn it around and give it another minute. Put it in a plate and sprinkle salt and pepper. In a non-stick pan, mix all the ingredients together. Light the fire and reduce the heat to medium. Stir the mixture continuously ensuring that the mixture DOES NOT STICK TO THE PAN OR BURN. As soon as the mixture cooks (that is when there is no liquid portion left), switch off the heat and while stirring continuously, turn it into a serving plate. Remember if the mixture becomes too dry, it will no longer taste creamy and if the mixture remains too wet, it will give a raw taste. A common pitfall is to add more milk than suggested or to forget to put the milk. In both cases, the scrambled egg will not taste as good as it is supposed to. 1. For the scrambled egg, in a non-stick pan, mix all the ingredients together. 2. Make the peas in a separate pan. 3. After removing the peas, in the same pan, make the roasted tomato. 4. Before starting on the scrambled egg, put the toast in your toaster (if you want toasts with your eggs)and switch on your coffee/tea machine (if you like a hot beverage) or pour yourself a glass of your favourite juice. 5. Make the scrambled egg. 6. 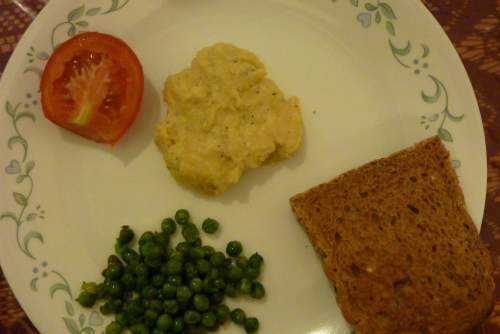 Your toast will get ready by now and you can have a breakfast of scrambled egg with toast, sauté peas, roasted tomato with your favourite beverage. This whole effort should not take you more than 15 minutes even if you are making a breakfast for a family of 4! Do tell us if you could manage that.